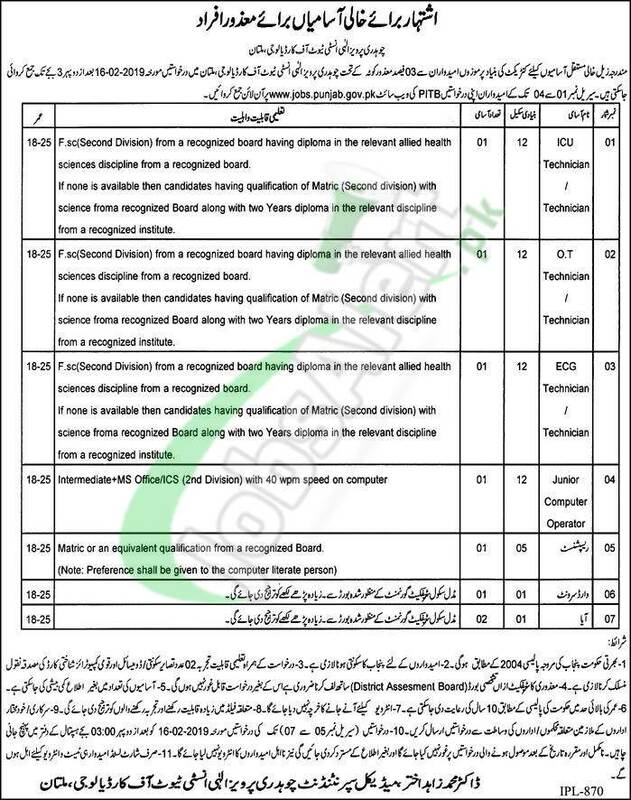 Here you'll get CPEIC Multan Jobs 2019 Chaudhry Pervaiz Elahi Institute of Cardiology for which only disable person are welcome to apply because announced jobs under disable quota. Multan Institute of Cardiology jobs to apply are such as ICU Technician, OT Technician, ECG Technician, Junior Computer Operator, Receptionist, Ward Servant, Aya on contract basis. Candidates possessing qualification from Intermediate to Matric/Middle and relevant skills and experience are welcome to apply via online and by hand on or before the last date 16th February 2019.